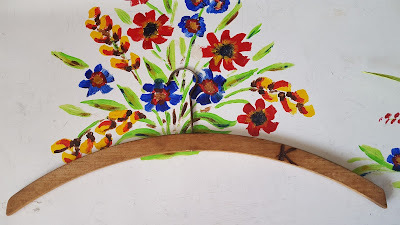 This week, with Valentine's Day fast approaching, I'm writing about an old wooden Coat Hanger - the one in the picture above. It dates from the late 1940s, and it has, as you can see, the letter K burned onto it in poker-work. It's precious to me. I use it every day. You see my late dad made it for my late mum, and that's her initial on it: K for Kathleen. Theirs was a love story as intense as any you will read in a novel. Julian was Polish, from a wealthy family. They lost everything in the war, including (most of them, anyway) their lives. He came over with a tank regiment, spent some time in an army resettlement camp before demobilisation, and stayed on as a refugee because there was no place to go back to. Kathleen was a young woman with a Leeds Irish background. My Leeds grandfather was an English Methodist called Joe Sunter. Except that the family were probably descended from Vikings and Joe, with his auburn hair, looked the part. The family had been lead miners in Swaledale throughout the 18th and 19th centuries, but had finished up in Leeds by way of Castleford, during the Industrial Revolution. Joe's mum had died young, and his dad had remarried. His stepmother wasn't very kind to the boys, so Joe and his elder brother George left home early, Joe to join the navy and George to join the army. George was killed at the very start of WW1 but Joe survived and Married Nora Flynn, my grandmother, a shirtmaker. 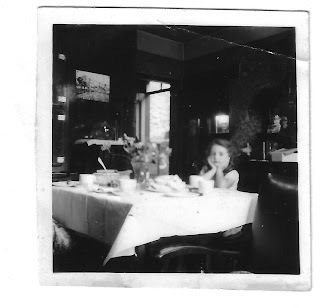 By the time my mother and father met (at a dance) and married, Nora was running a tiny stone floored sweet and tobacconist shop, next door to which Joe had an equally tiny fishing tackle shop - all within a stone's throw of the factories and mills of Holbeck. Mum and dad's honeymoon was in January, in Scarborough. My dad, I realise, must have seemed impossibly exotic to my mum. He was dark, handsome, foreign and very charming. He was also, fortunately, one of the kindest men I have ever known. I don't think they stopped loving each other for a single moment. Dad began by working in a mill, went to night school and eventually became quite a distinguished scientist, but he always loved to make things. In fact I remember that his hands were the hands of a working man, rough and capable hands that could garden and construct things and build toys out of wood. The coat hanger, with its letter 'K', wasn't one of his more challenging efforts. But it was, somehow, like him, that he would take the trouble to decorate it, just for my mum. In the picture at the top of this post, the hanger is resting on a rather battered wooden blanket chest that used to be in their house and is now in mine - and dad painted that too. I've realised over the years that I often find myself writing what I call 'grown up love stories'. They aren't really romances and my characters don't always live happily ever after. Not all of them are good and not all of them behave well. But at the heart of the novels is, I realise, something positive, some recognition of the power of affection and kindness to work a little magic in the world. I used to think it would be enough. Inside 32 Whitehall Road in the 1950s. Although in every other way I'm sad that mum and dad are gone, I find myself glad that they aren't around to see the rise of post-Brexit xenophobia, to hear tales of children being bullied for their Eastern European names, people being told to go back where they belong, the Home Office letters exhorting people to 'prepare to leave the country', the outrageous suggestion from some think tank that visas for EU migrants should be restricted to those working anti-social hours. Either we are all, as they say here in Scotland, 'Jock Tamson's bairns', or perhaps we should all consider going 'back where we belong' - if we can decide where we do belong. My dad belonged to a part of Poland that is now in the Ukraine. His mother had Hungarian ancestry. My great grandfather James Flynn came from Ballyhaunis in County Mayo but he helped to build Yorkshire's roads. 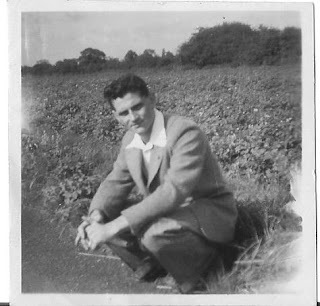 My grandfather belonged in the Yorkshire Dales and, long before that, in Iceland or Norway or whichever country his Viking ancestor set sail from, as an economic migrant. They were all, when you think about it, economic migrants. Dad always said that fascism could happen in any country, at any time and in any place. I think he was right. Nowhere is immune. But after all these years I didn't expect to feel the fear of it in my blood and bones, the way I feel it now, here in the UK.